If you’re looking for tips on saving money and finding creative ways to afford to raise your family, you’ve come to the right place. I’m Jamie, Mom of 5 kids and wife to a pretty cool Hubby. We’re mowing down our debt using mottos like #yearofno and #presson. Learn more about us here. Need a community of support to help you pay off debt? We’re excited to have you join us! Want resources for earning extra money to help you meet your goals? Find it here. Looking for big family tips from a mom who’s been there, done that? You found that, too. Kick off 2017 on the right foot. The Secure Your Savings and Find Peace in the New Year challenge is designed to help you fund your emergency fund or sinking funds. These steps are essential in helping you get out of debt and escape paycheck to paycheck living. Learn all about this challenge and how it can get you on track to meet your money goals by clicking here. By far, my most popular posts are the ones in my 5 Ways We’ve Saved Money This Week series. Each Friday I talk about 5 different ways we’ve saved money that week. You’ll find a long list of posts in that series, and you can read them in any order you like. What’s a sinking fund and why is it so important? Learn how breaking up your paycheck can help you pay off debt. This unique look at pennies will make you want to pick them all up. Here’s help for people trying to stop living paycheck to paycheck. I’m big on getting intentional and setting S.M.A.R.T. goals for yourself, so I try to post mine regularly. That way we can encourage each other! Find our 2017 Yearly Goals here. Monthly check-ins to make sure we are on pace. As a Mom of 5 under 14, I like to share when I find tips that work for us! So here are some of my more popular household and parenting posts. Are You Done (Having Kids)? Be sure to subscribe for behind the scenes info and money tips I don’t share anywhere else. 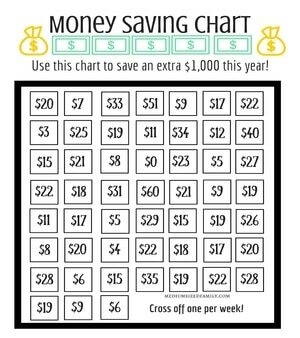 Subscribers will get a free printable for Spring Cleaning Your Finances (and rake in some serious cash!). Always feel welcome to leave a comment or e-mail me at mediumsizedfamily at gmail dot com any time! Happy reading!